Lake Natron, Tanzania. A very shallow salt lake is very dangerous for those, who are not adjusted: the temperature can reach 60ºC and its ph level is 10! 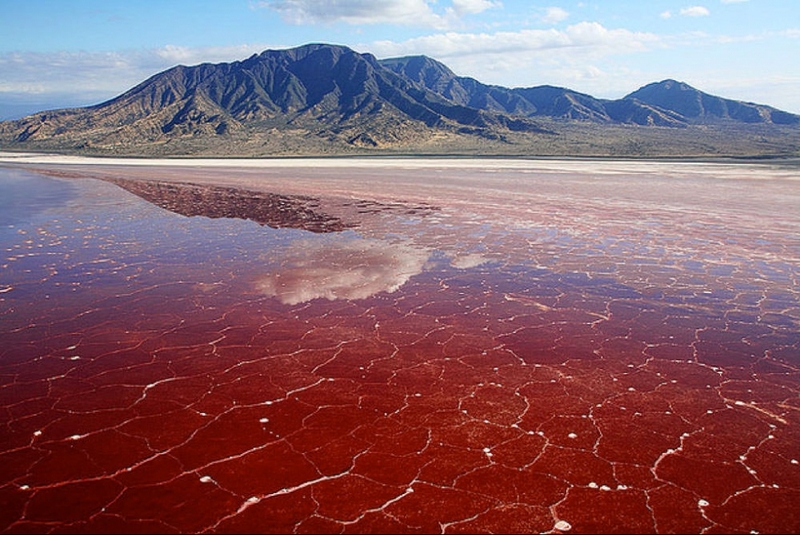 However, its rare red color makes Lake Natron a very unique and beautiful destination, which can be compared only to Laguna Colorada found in Bolivia. The color varies from orange to red, to pink and is produced by the bacterias and other microorganisms. Surprisingly, this lake is a habitat for flamingos, that nest here and feed on red algae despite the alkaline water. It is a safe breeding place for these birds, since no predators come to this unfriendly terrain. See this unique lake and the Natron area, which provides spectacular sites: from flats to escarpments, to volcanoes. Anytime – the weather is always warm. However, during the wet season (November to May) the afternoon thundershowers are often expected. See the area during a safari in Serengeti National Park or Great Rift Valley.